Western Family is a brand of Western Family Foods, Inc., based out of Portland, OR. They also own other brands including Shurfine, ShurSaving, Better Buy, and Market Choice. The company specializes in supplying stores and warehouses in small market areas with consumable goods. I found this package at a small grocery store while camping at Zion National Park recently. 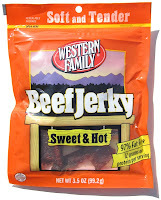 This brand of Western Family jerky was actually manufactured by Jerky Snack Brands of Mankato, MN. Beef, water, brown sugar, salt, white sugar, crushed red pepper, monosodium glutamate, sodium erythorbate, ground red pepper, granulated garlic, sodium nitrite. The first thing I taste from the surface of these pieces is a moderate sweetness, followed by a slight smokiness, and a slight saltiness. There's a faint bit of black pepper flavor. In the chewing, what I taste is more black pepper, a bit more sweet, and a bit more saltiness. I can also feel faint bit of spicy heat in the back of my mouth. As for being billed as a "Sweet & Hot" variety, what I can say is that there's indeed sweetness to this, but not a strong one. I'd rate the intensity at a medium level. But it's in no way hot. In fact, it's not even medium or mild-medium. I'd call this simply mild. While the ingredients lists "crushed red pepper" and "ground red pepper", it's not to be seen on these pieces, and not easily tasted. I do sense a faint bit of spicy heat in the background, and I do sense a faint bit of red pepper flavor, but it's so light that you wouldn't normally notice it. I do however get a strong dose of black pepper flavor. Some of these pieces are heavily laded with the stuff that it comes across quite strong. Other pieces offer only a light-to-medium intensity. Perhaps Western Family might construe the black pepper to provide the "hot", but in my opinion this jerky doesn't live up to the "hot" billing. Overall, I'd say the primary flavor of this jerky is the sweet. It's very noticeable on the surface flavor, and seems to continue through most of the chewing. The black pepper is perhaps the second-most strongest flavor component, varying anywhere from light to strong, depending on the piece. The saltiness is perhaps the third strongest, having a medium intensity. There are no natural meat flavors identified in this. Overall, you won't really perceive this to be a "Sweet & Hot" variety, unless you're one of the few who consider Dr. Pepper to be too spicy. Otherwise, this is more like a "Sweet & Black Pepper" variety. You're going to get a moderate amount of sweet and black pepper, with some saltiness. This is largely a dry jerky, though a few pieces are more like semi-moist. A small amount of bending will cause these pieces to crack open. They tear apart with my fingers quite easily, while the chewing seems moderately easy. While the package reads, "Soft and Tender" across the top, it's actually more like "dry, semi-brittle, but still easily eaten". The chewing texture seems somewhat steak-like, in that it has the fibrous quality, but there's a dry, crumbly quality to it as well. That is, when I chew it down, the the meat fibers don't really mesh together into a single chunk of meaty mass. But I wouldn't call it mushy or gummy. This jerky seems rather lean, however. I didn't encounter any bits of fat, and no tendon or gristle. And I didn't find any chewy strands of sinew. As for clean eating, I did find quite a bit of black pepper chunks falling off these pieces as I tore them apart, some of which landed on my lap or desk. But they don't leave any residue on my fingers. I paid $4.99 for this 3.5 ounce package at a Sol Foods store in Springdale, UT. That works out to a price of $1.43 per ounce. 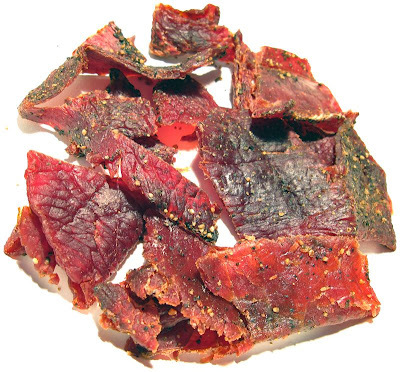 For general jerky snacking purposes, at this $1.43 price per ounce, this jerky seems to present a good value. 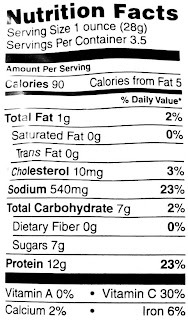 I was able to get an average amount of snackability from its decent flavor, it's good deal of flavor intensity, and easy to eat consistency. I think the snackability I'm getting out of this is a tad higher than the price I paid. As a Sweet & Hot variety, also at the $1.43 price per ounce, it's a weak value. It's not hot at all. I'd probably rank it as mild. Maybe those of you with sensitive taste buds might see it as hot, but then again, you wouldn't buy anything labeled "hot" anyways. Had Western Family dubbed this as "Sweet & Spicy", I might be compelled to consider it a better value, because the black pepper does indeed provide a spiciness. This Sweet & Hot variety from Western Family doesn't really come off as being hot at all. While it does provide a decent amount of sugary sweet flavor, it doesn't really provide any spicy heat. It does offer plenty of black pepper flavor, but I don't really find the black pepper to be "hot" at all. It's more like spicy, but not hot. Even though the ingredients lists red peppers, there's nary any to be tasted. 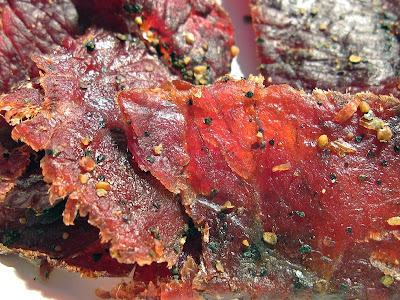 But otherwise, this jerky still provides a decent taste overall with its sweetness, black pepper, and saltiness. When you add that it's generally easy to eat, it has some good snackability. My recommended beer pairing, try a brown ale.